Republican presidential candidate Mitt Romney, former governor of Massachusetts, speaks to supporters and the media at a rally in Manchester, New Hampshire, on Sat. Dec. 3, 2011. 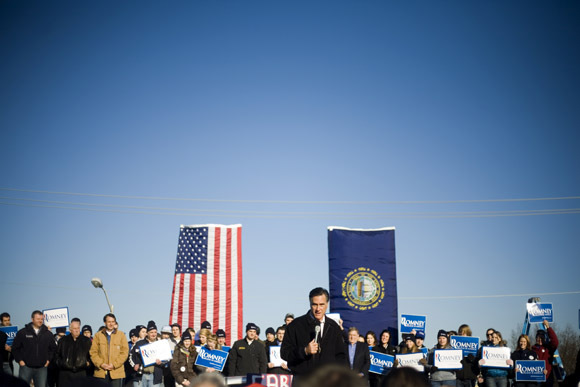 The rally was called, "Earn It with Mitt," and was designed to bolster local efforts to help Romney "earn" voters' support for the upcoming Republican primary. 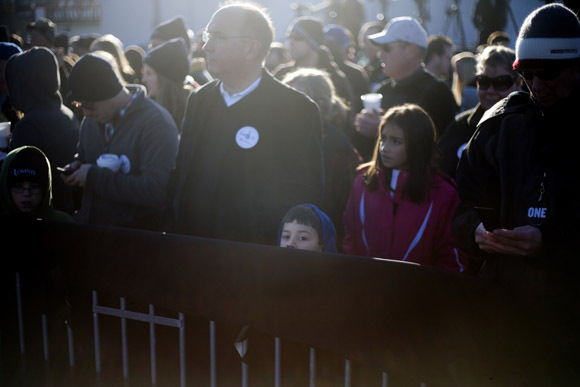 Romney supporters gather to listen to Republican presidential candidate Mitt Romney, former governor of Massachusetts, as he speaks during a rally in Manchester, New Hampshire, on Sat. Dec. 3, 2011. 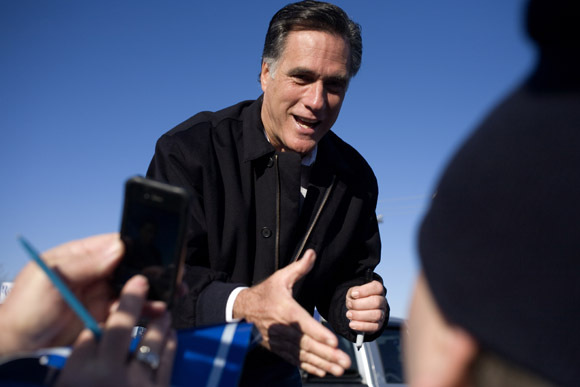 The rally was called, "Earn It with Mitt," and was designed to bolster local efforts to help Romney "earn" voters' support for the upcoming Republican primary. Republican presidential candidate Mitt Romney, former governor of Massachusetts, speaks to the media during a "press availability" after a rally in Manchester, New Hampshire, on Sat. Dec. 3, 2011. The rally was called, "Earn It with Mitt," and was designed to bolster local efforts to help Romney "earn" voters' support for the upcoming Republican primary. 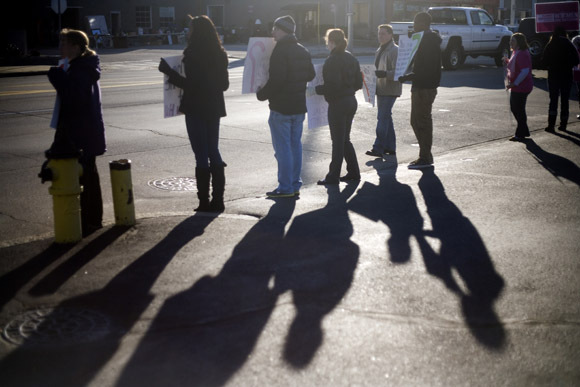 Protesters, including Planned Parenthood supporters, demonstrate for passing traffic outside a rally for Republican presidential candidate Mitt Romney, former governor of Massachusetts, in Manchester, New Hampshire, on Sat. Dec. 3, 2011. The rally was called, "Earn It with Mitt," and was designed to bolster local efforts to help Romney "earn" voters' support for the upcoming Republican primary. 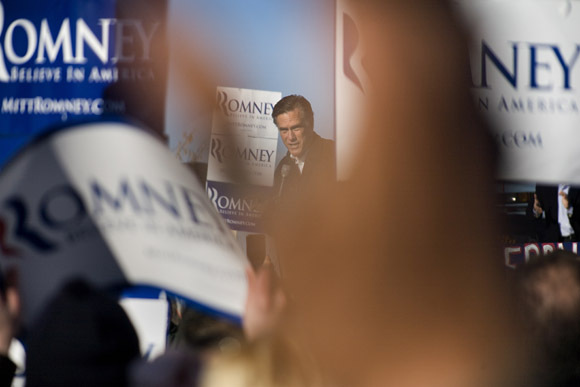 Romney supporters gather behind Republican presidential candidate Mitt Romney, former governor of Massachusetts, as he speaks to the media during a rally in Manchester, New Hampshire, on Sat. Dec. 3, 2011. 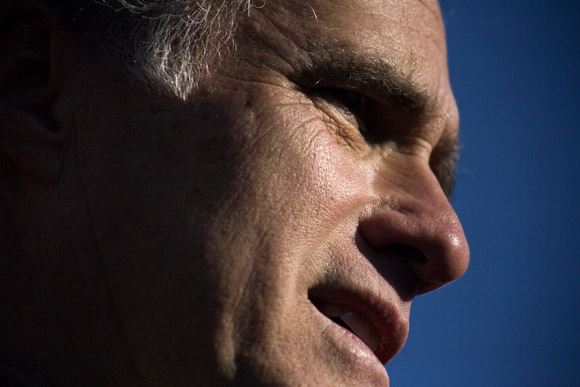 The rally was called, "Earn It with Mitt," and was designed to bolster local efforts to help Romney "earn" voters' support for the upcoming Republican primary. 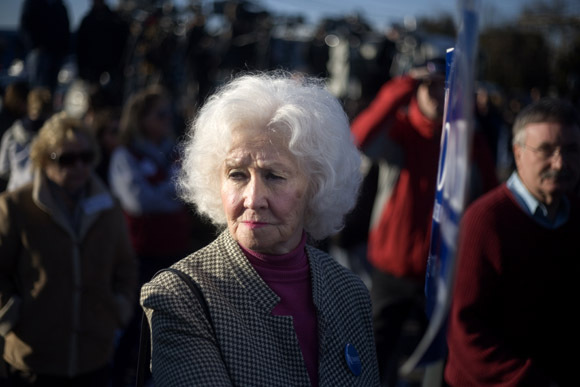 Romney supporter Barbara Clark, of Nashua, NH, waits for Republican presidential candidate Mitt Romney, former governor of Massachusetts, to at a rally in Manchester, New Hampshire, on Sat. Dec. 3, 2011. The rally was called, "Earn It with Mitt," and was designed to bolster local efforts to help Romney "earn" voters' support for the upcoming Republican primary. Clark is a lifelong Republican, having voted for Republicans since Eisenhower. "The only Democrat I voted for Koch in New York," said Clark. Republican presidential candidate Mitt Romney, former governor of Massachusetts, greets supporters and signs autographs after a rally in Manchester, New Hampshire, on Sat. Dec. 3, 2011. 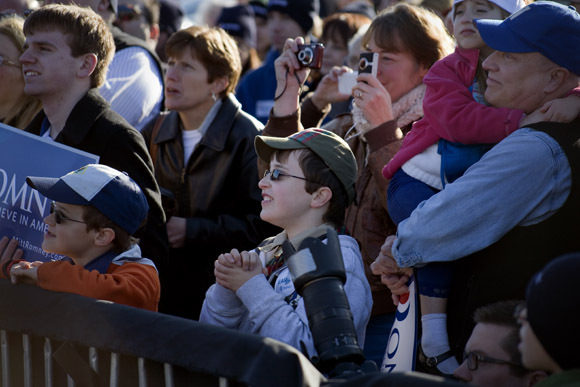 The rally was called, "Earn It with Mitt," and was designed to bolster local efforts to help Romney "earn" voters' support for the upcoming Republican primary. 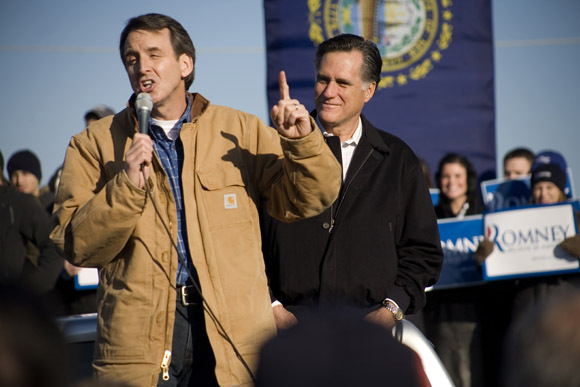 Former governor of Minnesota and Republican presidential candidate Tim Pawlenty (brown jacket) speaks to the public in support of Republican presidential candidate Mitt Romney, former governor of Massachusetts, during a rally in Manchester, New Hampshire, on Sat. Dec. 3, 2011. 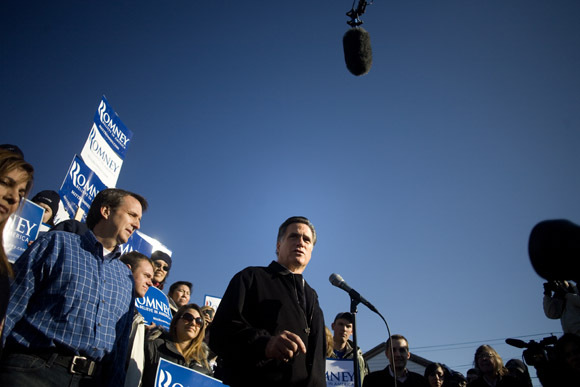 The rally was called, "Earn It with Mitt," and was designed to bolster local efforts to help Romney "earn" voters' support for the upcoming Republican primary. 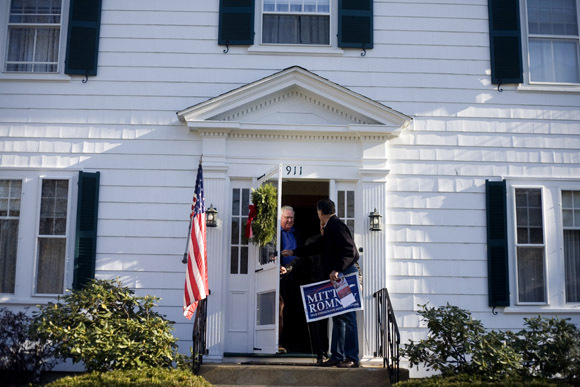 Republican presidential candidate Mitt Romney, former governor of Massachusetts, speaks with supporter James Conway at his home in Manchester, New Hampshire, on Sat. Dec. 3, 2011. The neighborhood traditionally votes Republican. Romney spent about an hour walking through the neighborhood knocking on doors to speak with likely primary voters in the area. 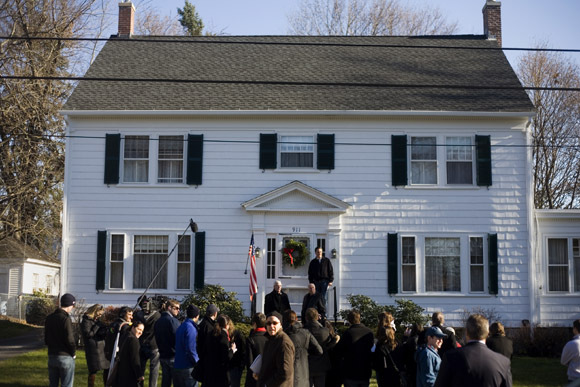 Members of the media watch as Republican presidential candidate Mitt Romney, former governor of Massachusetts, walks through a neighborhood and knocks on the doors of likely primary voters in Manchester, New Hampshire, on Sat. Dec. 3, 2011. The neighborhood traditionally votes Republican. 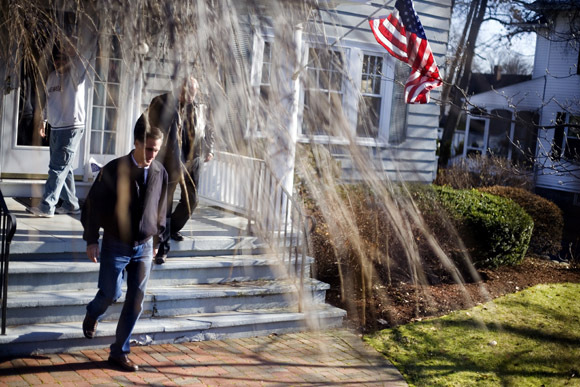 Joined by local politicians, Republican presidential candidate Mitt Romney, former governor of Massachusetts, walks through a neighborhood and knocks on the doors of likely primary voters in Manchester, New Hampshire, on Sat. Dec. 3, 2011. The neighborhood traditionally votes Republican. I’ve been following the 2012 Republican presidential race in New Hampshire whenever I get a chance. This weekend, I went to Manchester, NH, to photograph Mitt Romney’s efforts to get out the primary vote with a rally for supporters and a short period of canvassing a neighborhood of likely Republican primary voters. It’s been eye-opening to watch this process up close (literally close! I’ve been close enough to touch any of the candidates I’ve photographed.) and to see how manufactured the process is for the media. Every event is carefully coordinated so that members of the national media are present. I’m not always successful at finding a unique perspective of the pageantry, but I enjoy trying. More pictures from the day are available in my archive: 2012 campaign – Mitt Romney in Manchester, New Hampshire – 3 December 2011.